Our sailing Club has long been well supported by the community of Torpoint. Founded in 1891 and operating continuously to the current day many people have enjoyed the sailing and social activities organised by members for members. The resignation of Mr D Grainger as Secretary was received by all the members with regret. He has held the post since the formation of the Club in 1891. and much of its success was due to his untiring efforts. But he was now unable to give so much attention to the work. As a compliment and acknowledgement of his work he was unanimously elected President of the Club, and a vote of thanks to him was carried 'with acclamation'"
In order to understand the circumstances that led to the development of the Club we need to reflect on the way of life before the turn of the century. Road travel was by foot or horse and carriage so Liskeard would have seemed distant to local people, and although a ferry service had been in existence since 1791 the road to Plymouth was indeed difficult. Sailing in the 1890s was therefore an important facet of community life. Apart from a few steam pinnaces, sail and oar were the principal means of transport on the water in those days and particularly so for Torpoint people, many of whom earned their living from their sailing work boats by conveying goods or fishing. These boats with gaff rigs and heavy canvas sails must have created a very picturesque and busy scene on the river. No doubt the local community would have looked with interest and envy at the great yachts which were sailed into the Hamoaze from time to time before the turn of the century or indeed the yachts owned by the privileged few which raced from Plymouth as far a field as La Rochelle and the North Sea. Perhaps a taste for racing was acquired by local fishermen who supplemented their income by crewing on these boats. Before the Club's inception in 1891, sailing regattas at Stonehouse and Devonport were already well known and attracted entries from local sailing work boats. One well known gentleman, reports that competitive sailing was taking place at Torpoint, several years prior to the formation of the TMSC, but the first evidence of the existence of the Sailing Club is to be found in an article written in the local newspaper “The Western Morning News" which refers to the Club's inception in 1891. The New Club evidently generated much local interest and we learn that large crowds would watch the initial races from the ferry slip area. During those early years the first silver cup was donated by the Town Band (called the Tyhee Orphans). The start line used was just South of the present ferry with races that were started by a shot gun. The first sailing results were recorded in 1894 along with the first official rulebook. Early Club records are indeed sparse but fortunately the race results were sent to local newspapers so we know that boats sailed regularly so forming the first racing fleet at Torpoint. The Club premises, which were situated just north of the ferry slip way, comprised a boat shed in which Mosquito Class boats were kept and on the second storey an apartment which was sublet to a Mr Lawson, who paid the Club a magnificent sum of £10 p.a. Further boats were kept in the yard surrounding the premises. Outside the Clubhouse a long wooden pier stretched out to deep water and a useful winch on the beach helped to slip the rather heavy Mosquitoes. These early Mosquitoes had many surprising features such as a lifting iron keel, rolling headsail, lifting rudder and loose fitting foresail boom. The size of the canvas, not easily reefed, would have made them a daunting prospect for the faint of heart, being without winches and having a sail area of 350 square feet on a l6ft length boat. Later Mosquitoes had to conform to a length of either 16 ft or 18ft. Due to weight they were largely left on moorings and, since anti fouling paint was not used, frequent careening took place by pulling the boat on to its side, using the top mast halyard, and exposing the side to be scrubbed from the dinghy. With a large and critical supporters club standing on the shore. and keen inter-skipper rivalry, competition was high. We learn that sand ballast would be taken on the windward leg and we even heard of crew members becoming redundant on the last downwind leg and being asked to swim ashore! With his boat “Seagull" Tom William's grip of the racing scene was evident from 1891 until the turn of the century when . In 1899 saw the arrival of the first architect designed boat (by Linton-Hope) to be seen at Torpoint built for the Reep brothers and named after Jack's wife Frances. It was raced with great success in the Tamar, Plymouth Sound and even as far as Salcombe and Fowey, to where she was carried on the deck of the “Shamrock". This famous work boat was renovated during 1972 at Cotehele Quay where she can be found today. the “Frances" began to provide serious competition, just 2 or 3 years after her arrival at the Club. The sailing skills of the Reep brothers (Jack, AIf and Bert) kept this gallant little boat in the forefront of local racing for 40 years making it probably the most significant boat in the Club's history. Competition at the turn of the century was very keen, and Gilbert Tong had a boat built by Scantlebury's – the “Westward" – which gave the “Frances" a good run for her money. From that time forward, until the time of World War II, “Frances" established herself as the boat with the most formidable racing record and she dominated the racing scene for practically 40 years. On 23 occasions she won the Club's Tyhee Minstrel Silver Cup. Other winners included Tom Williams in “Seagull", A Trotman in “Cygnet", P Nodder in “Dorothy", Tom Hambly in “Westward", Fern Bradford and Herbie Snell in “Blue", “Quiz" and “Oriental". Sid Mashford from the famous boatbuilding firm and a keen member of TMSC built a boat specifically to challenge the “Frances". His boat “Foam", did win many cups but was not able to dislodge the supremacy of the Reep brothers in “ Frances". Clearly by the turn of the century the Club had well established itself in terms of boats and people but no records exist of when the premises North of the ferry were first used. One of the great characters of this period was Charlie Greenho who sailed “Wild Rose" with great enthusiasm. Not a man to shorten sails if at all possible, his numerous capsizes were legendary and the story goes that he lost so many watches during his capsizes, that on one occasion, he borrowed his father's marble clock to take on board for the race. Yes, you've guessed it! He capsized yet again and undoubtedly had a lot of squaring to do with Papa. In those days successful boats would subsequently race with an increased time penalty. Charlie Greenho, with his sights set on winning one particular cup had worked the handicap system so that he had only to finish a particular race to win the cup, Three quarters way around the course with the light failing and no crash-down time set, Charlie and the fleet were becalmed so with an adverse tide he put down an anchor whilst the rest of the fleet retired and at 10.30 pm. in complete darkness, the timing officer of the day heard a voice coming across the water "DID YOU GET MY TIME? They gave him the cup & though suspicions were high that he had paddled back! A well known local historian and sailor, Jim Broad well remembers when sailing in “Clara" how Bert Reep in “Frances" deployed a tactic of winging his large boom out at right angles to keep “Clara" well clear of the buoy when they were rounding the mark. This must have created a lively after-race discussion! Competition during this time was certainly at fever pitch and more than one newspaper cutting deplored the onshore arguments that followed a race. One angry member is reported to have chased another with an iron bar! Modern day disputes are indeed, relatively mild! The introduction of cotton sails in the early 1900s had made boat handling easier, but in the early days of the 20th century, an astonishing amount of gear failure is recorded. The failure of chain plates, booms and rigging, changed the result of many a race. In the late 1920s. Commodore Peck created a pleasant tradition with the introduction of the Commodore's Strawberry Feast Cruise to Cargreen. Club boats sailed to the Royal Oak (now the Spaniards) Inn at Cargreen where the Commodore paid for everyone's lea of strawberries, an occasion that was well attended and enjoyed by all! A well attended Club dinner, the Annual Dance and frequent Whist Drives all gave the Club a healthy social life between the wars. The Club premises, at this time, were not suitable for holding social events so they had to be held elsewhere. Reports and records from these inter-war years suggest a vigorous and happy Club. By 1930, many local boats unable to measure as Mosquitoes had formed the Torpoint GNAT Sailing Club and this was indeed a popular fleet. There is evidence to suggest that the GRATS were numerically greater than the mosquitoes. the two clubs regularly held a joint annual regatta during the 1930's and the number of gnat entries was impressive. Williams owned the first of this class at Torpoint and she was called "Whisper". These Bermudian rigged sloops were clinker built and raced with the GNATs. Their tall rigs made them somewhat unstable and after a gale they were often to be found capsized on their moorings. Ron Boyce owned "Restless", Jim Bowden had "Boy Tom" and Len Mashford owned "Ripple". Around 1935, Lord Russell of Liverpool joined TMSC, as this area was his favourite venue for holidays. He bought a Troy class boat, which he sailed from Torpoint, with the help of Herbie Snell. Although none remain today in Torpoint. the Troy class still persists in Fowey. where they are enthusiastically raced. Just before World War II. newly designed boats were coming on to the club scene. The performance of the new International 14s finally led to Frances" feeling her age and she slipped a little in results, despite a change to Bermudan rig. With the advent of World War II, the Club necessarily entered a dormant period. Sadly. a direct hit by a German bomb on to the Club's boathouse at Quarry Street, just North of the terry slip, demolished the Clubhouse and the famous "Frances' together with several other boats, so ending an era. Herbie Sneli's 'Oriental", an International 14 survived because with great foresight, he had taken it to Pensilva earlier in the war years for sate keeping. After the war, due to bomb damage, racing was limited at first to the International 14s gradually, other boats appeared on the scene again and the indefatigable Bert Peep reappeared to help organise the racing. By this time. the second ferry was in use, which meant the starting line had to be moved South, off Carew Wharf Quay, close to where it is today. Remaining sailors from the two Clubs – TMSC and Gnats thought it sensible to henceforward work together and in 1947 agreed to amalgamate. This combination of the two Clubs set the members searching for new premises on which to build a Clubhouse. A new site was finally found at the derelict premises of the Western Counties Manure Works, the present site of the Clubhouse. The land was owned by Sir Jon Carew-Pole, and with the help of Torpoint Council, members first agreed to a tenancy, but were later able to buy the land for £500. Forever opportunists, Club members found nearby, 3 galvanised Nissen huts, made redundant by the disbanding of the Torpoint Barrage Balloon Unit. Prior to obtaining the Manure Works site, the members had tried to erect these Nissen huts on the Town Beach, opposite the King's Arms, much to the consternation of local residents, who wished their beach to remain unspoilt. By 1948, all had been amicably settled and plans were made to establish the Club on its present site. It is not hard to imagine the fund of enthusiasm that developed to create the new Clubhouse, as many locals came forward to help with the building. Few would disagree that the driving force at that time was Fern Bradford. He sold shares in the town and collected donations and, with support from many others, £800 was raised. With this sum in hand, building was begun. Without doubt these were halcyon days in terms of Club spirit and co-operation as people begged, borrowed and scraped for materials and gave their time freely to produce a fine Clubhouse. We know the parquet flooring was donated by Sercombe Oliver, but it is a great pity that detailed records were not kept of the charity of others. Some who gave strong support, at the time were Fern Bradford, Herbie Snell, George Furzeland and his brother Bert, the Peep brothers, Howard Frost, Alfie Cook, Fred Johns, Jim Hambly, Arthur Hancock, Aubrey Long, Harry Cann9 Jimmy lsaacs, Ed Clements, Art Reynolds Peg Wiltshire, Jimmy Jones and many1 many more. The corner window in the lounge later became known as "Peep's Peep" because of the hours Bert spent looking out at the boats. To those members, who were so deeply involved in the creation of the Club, a debt of gratitude is owed. The opening ceremony in March 1949. was indeed a big day for the Club. Despite wet weather, a packed assembly heard Admiral Sir Robber L Burnett declare the Clubhouse open. Some who gave strong support, at the time were Fern Bradford, Herbie Snell, George Furzeland and his brother Bert, the Peep brothers, Howard Frost, Alfie Cook, Fred Johns1 Jim Hambly, Arthur Hancock, Aubrey Long, Harry Cann, Jimmy lsaacs, Ed Clements, Art Reynolds Peg Wiltshire, Jimmy Jones and many many more. The corner window in the lounge later became known as "Peep's Peep" because of the hours Bert spent looking out at the boats. To those members, who were so deeply involved in the creation of the Club, a debt of gratitude is owed. The opening ceremony in March 1949.
was indeed a big day for the Club. Despite wet weather, a packed assembly heard Admiral Sir Robber L Burnett declare the Clubhouse open. Perhaps it was a reaction from the austerity of the war, but these were times of great activity within the Club. With many ex-naval men among its membership, it was natural that close links were forged with HMS Fisguard and HMS Raleigh. who would support regatta days with many gigs, whalers and cutters. This tradition of co-operation with the Navy has continued to the present time 1949 was indeed a vintage year, Fern Bradford. looking for a new International 14 in the Isle of Wight, contacted Uffa Fox, who was well-known for his International 14 designs. He was introduced to the new Flying 12s and 15s created by Uffa. Two Club members later visited the Torquay Regatta to see the first launched Flying 15s, and along with a certain Royal personage were very impressed by its grace and performance. They came back to Torpoint determined to introduce the class to the Club, and with Aubrey Long permitting his premises near to the Library to be used for building, soon the fleet took shape. As a mark of gratitude to Aubrey for the use of his resources, it was decided that the earlier boats should have his name incorporated, thus. they had "Stormalong", "Spinalong". "Foamalong" and "Gnola". among others. With typical Club generosity of those times. a crane was donated for launching the boats by Jimmy lsaacs and Harry Cann. Club members would travel considerable distances to compete in races, Aubrey Long travelling to Scotland and the Medway where, in 1960, he clinched the Southern Area Championships in "Sharko". The class was given esteem when Prince Philip received his Flying 15, called ' Coweslip", from the people of Cowes. With so many of his 15's at TMSC, Uffa became a member and was a frequent visitor to the Club. He was a swashbuckling character, drinking, telling jokes and singing with the best of them. The Flying 12s did not really take off, though a very young Richard Long crewed in "Scattered Foam", along with Uffa Fox. It must be remembered that other classes of boats were sailing from the Club at this time. They included a fleet of about 20 Dolphins, first built in Mashfords Yard. International 14s, and Redwings. Sid Harris, President of TMSC today. sailed his Dolphin "Seafury" with considerable success. He remembers how popular these boats were in Torpoint and the Port of Plymouth. The design was brought over from America as a recreation boat for large American Navy craft and they quickly caught on in the Plymouth area and at Torpoint. There was also quite a large fleet at Cawsand. The first 4 Torpoint boats were built in a Nissan hut by Fres Johns. During the 1950s, Ray Cook became National Champion in his Shearwater Catamaran "Avanti". A large fleet of International 14s were racing flt this time. On one occasion TMSC hosted the prestigious Prince of Wales Cup. HRH Prince Philip was scheduled to sail "Coweslip" across the TMSC start line – an event which might have made us the Royal Torpoint Mosquito Sailing Club! Sadly, the In those days, there was no need to rely on a klaxon to start a race, for mounted on the quay was a set of beautifully polished starting cannons which gave a deafening report. It is interesting to mention. at this stage. another device known as the Minute Board, which had been used for many years. It was of great benefit to those sailors prior to the days of waterproof watches. It was a swing board system, counting the minutes down to the start time. The Swing board was operated by Bert Reep and it would be hard to overstress the great services to the Club of the Reep brothers. They had galvanised and influenced the Club for over 50 years. In the mid 1950s, a remarkable local school master called Bert Jones, realised that sailing had been largely an adult preserve. He persuaded the Committee to allow him to form a Cadet section. With a generous donation by Harry Cann, which enabled 6 boat kits of the Cadet class dinghy to be bought. Bert gathered around him a group of enthusiasts, young and old, to assemble the boats. Since he was the woodwork master at the local school, he was able to form the first school cadet section in the country, writing a guidance booklet on the subject. T S. OLIVER, Cross Cottage, Crafthole. A. HANCOCKS, 4 Montpeiier Tce., Torpoint. A. E. JONES, 16 Chapeldown Road, Torpoint. I. A. BAILEY, 22 Raynham Road, Stoke, Plymouth. Clubhouse with licensed bar, lounge and billiard room. Three boathouses for winter storage and drying sails. Changing room and workbench. Crane for lifting out. Moorings off club for eight craft up to 20 feet. Meeting    Spring, 16th and 17th June. Flying Fifteen aggregate for remaining Tuesdays. Catamaran aggregate for remaining Tuesdays. Cann Cup Cadets. aggregate for 12 Saturday races. Cann Coronation Trophy Handicap aggregate (5th and 6th August). Reep Cup Greatest number: a firsts in Club Races. N.B. All races count in Handicap aggregates. 80 per cent races count in Class aggregates. There are Club members in the 1990s who owe their interest in sailing to Ben's foresight and vision. The early 50s saw the emergence of the Enterprise dinghy fleet, with about 10 boats sailing regularly. Well remembered competitors of that time were John Hancock, Tony Ayers, John Blagdon, Alan Johns, John Bailey. Eric Duguid, John Pacey, Eric Black Cliff lsaacs. Roger Harvey along with many others. Club events at this time included regular sailing fixtures against Restronguet. Looe and Oxford. With the decline in the dinghy fleets came also the decline in support of the Club to save themselves from financial ruin, the Club was grateful for the support of the Columba Rugby Football Club who patronised the bar after matches. Ed Summers who had sailed "Kingfisher", a l7ft Dolphin. was a member of both Clubs. Many members made loans to the Club, which helped to see it through this sticky patch. In the early 70s, the then Commodore, Dr Ken Prior devised a scheme sponsored by Club members to buy kits for Mirror Class dinghies for youngsters1 to rejuvenate the Junior interest. Members would sponsor the money required and were repaid by instalments by the family acquiring the boat. John Blagdon built the first kit for the club, whilst John Newcombe bought in many Mirror Dinghies to sell on to parents. Under the encouragement of Dave Bradford, Barry Weighill. Sid and Frances Knott and John Newcombe, to mention but a few, the class rapidly expanded to a fleet of 28 boats. with some first rate helmsmen emerging. During these times the children benefited tactically from the expertise of club member Tony Ayers. 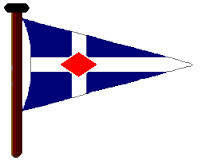 himself a past cadet sailor and twice National Champion in the Mini-Sail class in 1969 and 70. The years between 1960-75 were largely ones of debt. Once the debt had been cleared, the Club could set about the long overdue refurbishment. This included removing the bar which divided the Club premises into two rooms, known affectionately as the House of Commons and House of Lords. The new bar down the northside of the Club completely altered its character. In 1978 Sir Alec Rose. the solo Round the World yachtsman, came to open the newly renovated Clubhouse. The committee had thoughtfully arranged for Sir Alec's boat, "The Lively Lady", which was on permanent loan to the Island Cruising Club, to be sailed from Salcombe to the Club's moorings, which was a delightful surprise for Sir Alec who had not seen her for sometime. teams bringing a special atmosphere to the Club. A feature of this era was the Annual Water Sports. With much input from Roy Cook and Richard Humpherson, members would do such heart-testing activities as pounding around the Ballast Pound wall drinking beer – jumping off the wall to swim the entrance gap and racing back to the Club. To help the event Kate Ripley worked hard to raise funds by a weekly Sunday draw. Great crowds would gather to watch TMSC "at play". The Club was now picking up in financial and sailing terms, notably in the marked increase in the number of cruisers. Soon all the mooring spaces were taken. Cross Channel racing to Tregiuer began in the 70s and increased in popularity in this period. Today we are proud of our Fleet of two divisions of yachts, which frequently exceeds twenty boats taking part in Club racing and more than forty boats capable of coastal and offshore sailing. In 1984 Commodore Mike Morgan saw an opportunity to develop a link with the sailing club at Plouguerneau in Brittany and in subsequent years groups of yachtsmen have crossed the Channel both ways, strengthening the ties, A feature of this twinning, has been the Annual Pursuit Race from Torpoint to Plouguerneau, an event in which lately our French friends have also enjoyed competing. This race, along with the Guernsey race are firm favourites on the offshore calendar. More locally. our links with Looe and Fowey Sailing Clubs are growing stronger with cruises and races taking place regularly to these ports. After a lean period in the mid 80s when the Mirrors all but disappeared, a new sail training programme was created by several enthusiastic parents, lead by Mike Pearson, which soon produced an effective structure for children aged from 10 years to learn to sail using the RYA Training Scheme. It had the effect of regenerating a new group of children into the social and sailing aspects of the Club. For over 30 years the much loved Enterprise fleet has been the mainstay of the Club dinghy racing and although the Club fleet has seldom seen more than 10 TMSC boats racing regularly the standard and competitiveness has been high. Members have travelled great distances to World and National Championships proudly representing the Club and in recent times the Club has become a venue for a regional competition called the Travellers Trophy. Twice weekly Club racing has provided Club members with compelling and attractive viewing of the Enterprise and Mirror fleets. across Channel and as far as Spain. Lately one or two of the older ones, like Nick Pearson have shown great promise in dinghy races Nick having recently won the T.S.B. Trophy for Mirrors, a race drawing competition from Devon and Cornwall. In 1986, Pete Goss, a TMSC member, took part in the Two Handed Transatlantic Race – coming 2nd in class ( having to pump out for 15 days) and again in 1988 the Club Burgee was flown by Pete when he sailed a 261t catamaran 'Cornish Meadow' in the Observer Single Handed Transatlantic Race (a BBC. Documentary was made of 'Cornish Meadow' during this race) coming 2nd in class. Pete was awarded in 1988,the Scott Badar Seamanship Trophy for Outstanding Seamanship and in 1989 he also received the RNSA Sir Alec Rose Trophy for Outstanding Single Handed achievement. Pete has now joined the British Steel Challenge project as Training and Development Manager responsible for the training of the would be entrants for the "Round the World Race". The yachts for this race were built in Devonport Dockyard and a number of club members were actively involved in the construction and fitting out. Visitors have always commented on the warmth and friendliness of TMSC and this reflects the strong social tradition of the Club. The opening of the Tamar Lounge and kitchen in 1990 with its many uses, such as receptions, dining facilities. meetings and film shows has further expanded the Club's social horizons, allowing two functions to take place at the same time within the premises. Today our membership of 1000 reflects the varied interests to be found in the Club and TMSC can be proud of the key role it plays in the sailing and social activities of the region. One of the great strengths of TMSC is the accommodation of so many boating interests. The bar conversation resounds to tales of fishing off the Eddystone, nipping around in family runabouts, pursuit races to Cargreen by dinghy or cruising to Spain or further. These activities give our Club its refreshing and unique character and we can but hope that the next 100 years will be as dynamic, varied and interesting as the last 100 have been. Perhaps this booklet will help new members to feel a sense of identity and pride with this long established and active Club, for we hope that from their ranks will come the energy and dynamism to ensure the future prosperity of the Torpoint Mosquito Sailing Club. A Tribute to those who built the Torpoint Mosquito Clubhouse. from Landlubber – written 8/2/49. As "One of the very best". Possess a "Home from Home". And all "pulled up their socks"
And appeared as "gay as kippers'. As they handled concrete blocks. Obeying orders the Vice-Comm. gave. Through his trusty clubmate Jim. The Club, all view with pride. Soon cheered him up again. No rubbish now is lying. For your old pal Joey G.
* Stanley's mixture of mortar.